Two sisters on the edge of poverty have a chance to meet wealthy, titled, unmarried gentlemen when they are unexpectedly invited to a house party at a famous country estate owned by the Duke of Carlisle. Though courted by a wealthy earl, Catherine Forsythe finds herself falling for the handsome estate gardener and faced with the choice of marrying for money and security, or following her heart. Candice “borrowed” the story idea for A Garden Folly from an old Hollywood romantic comedy. Learn which movie inspired the plot, and which real English estates and gardens inspired the fictional Chissingworth. Romantic Times BOOKclub awards 4 ½ stars to A Garden Folly. Their review says: "A craftsman of impeccable elegance, Ms. Hern taps brilliantly into the hopes and fears of the human heart as she weaves an unforgettable love story from our deepest fantasies." Rendezvous says: "Ms. Hern has written a delightful book with captivating characters, each of whom has their own particular foibles brought wonderfully to light through enchanting dialogue. 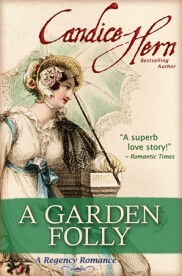 Both humorous and bittersweet, A Garden Folly is an excellent read!" Under the Covers Book Reviews says: "Candice Hern comes through with yet another stellar performance. A deeply moving and emotionally charged novel, A Garden Folly is destined to become a perennial favorite." A Garden Folly hit #1 on the Kindle Historical Romance list and #1 on the Kindle Regency Romance list. A Garden Folly hit #1 on the Apple iBooks Historical Romance list. Stephen gazed down into the flashing eyes of a very pretty little termagant. Bloody hell! He was in for it now, for she was no doubt one of his mother’s guests. He hadn’t expected anyone in the gardens this early. He had not been paying much attention to the path, his eyes surveying the center garden as he hurried past. He had not seen the girl as she knelt down at the edge of the gravel walk. And here he was sprawled atop her in a most improper manner. If it wasn’t so awkward, he might be tempted to enjoy it for a moment. She really was very pretty. Dark blond curls were revealed beneath the bonnet that had been knocked askew. Her brows and eyelashes were a much darker color, providing a striking contrast to her fair hair. Her eyes, framed by the long, dark lashes, appeared to be gray. She really was very pretty. “Get off me!” she repeated in a choked voice. She grabbed his hand and allowed him to pull her to a sitting position. She neither looked at him nor answered him, but adjusted her bonnet. “You might have looked where you were going!” she said in a petulant tone. She sat up on her knees and Stephen offered his hand again. She took it, pulled herself upright, then immediately dropped it to shake out her skirts. “I am terribly sorry,” he repeated, brushing himself off and searching the area for his hat. He did not know what else to say. He was reluctant to get into a conversation with the young woman, attractive though she may be. If she recognized him as the duke—which she had thankfully not yet done—there was no telling what sort of fuss she would make. He must get away as quickly as possible before the chit realized who he was and went squealing off to the other guests that she had sighted the elusive duke. Damn his mother and her parties, anyway. Why couldn’t they leave him in peace to putter in his gardens? Stephen moved closer, thinking she might have injured her hand and cursing himself for his own carelessness. “What is it? Have you—” He paused as he saw that she was not injured, but was holding on to a crushed purple blossom. Good God! It was one of his violets. His prized, rare, pure-bred violets. “Your flowers?” she said, her eyes widening in surprise. Good Lord. He had given himself away. What an idiot! He was in for it, now. “Oh! You must be the gardener,” she said. The gardener? Looking down at himself, he realized that no one would take his scruffy appearance for that of a duke. He experienced an almost uncontrollable urge to laugh. “Yes,” was all he could say. They were his gardens, after all. And he did design them and work in them. So in a sense, he was the gardener. “Well, you still might try to watch where you are going next time,” the girl said. By God, she was looking him straight in the eye and truly believed he was the gardener. It was too good. The petulant tone had disappeared and she seemed less offended. Interesting. He would have expected most young women of her station—for she must be aristocratic to have been invited by his mother—to disdain the working staff. He would have expected her to rail against his clumsiness, to threaten to report him to his employer, to exert all the superiority of her station. Instead, she looked wistfully down at the crushed blossom in her palm. Stephen’s breath was almost knocked clean out of him as he listened to this extraordinary speech. Here was a very pretty young woman, with dark blond curls spilling out of her bonnet and huge gray eyes peering at him guilelessly, who knew about rare flowers and special hybrids—his favorite subjects—and wasn’t fawning all over him. And she actually had no idea who he was. He could not keep from smiling. Good Lord. What was he to do now? Introduce himself as the owner of Chissingworth, not merely the gardener? How would she treat him, then? Her open, artless conversation would change to egregious fawning and preening, and that inevitable predatory glint would brighten her eyes. He did not believe he could bear it. And so, how should he introduce himself? Give his name as Stephen Archibald Frederick Charles Godfrey Manwaring? Would she recognize that moniker as belonging to the Duke of Carlisle? Perhaps not. Perhaps if he just shortened it, did not give her all the important bits, he might get away with it. “I am Stephen Archibald,” he blurted, without further thought. By God, it had worked. She believed it. Miss Forsythe truly believed him to be Mr. Archibald, the gardener at Chissingworth. He bit back a grin. It was almost too perfect. “Shall we meet again tomorrow morning, then?” In for a penny, in for a pound. “I could show you the botanical gardens where the more exotic plants are kept.” It was the least frequented area of the estate and they were unlikely to run into any other wandering guests. With a wave and a smile, she was off, disappearing through the entrance to the rose garden. Stephen watched her go and gave a wistful sigh. And wondered what on earth he had got himself into.